"Variation in payroll in baseball explains less than 20 percent of the variation in winning percentage"
That quote is from Dave Berri, professor of economics at Southern Utah University. He researches the economics of sports. 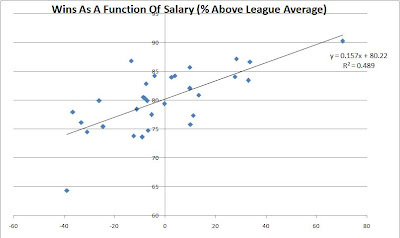 See Why Masahiro Tanaka’s Yankees Contract Is Good for Baseball at Freakonomics, 2-4-2014. 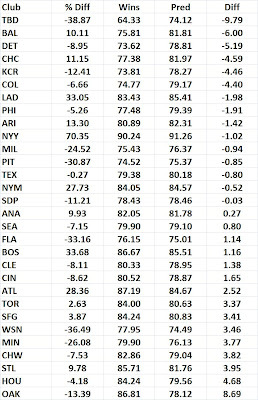 "One reason why spending doesn’t match outcomes is that forecasting the future in baseball is difficult. We can look at the stats and know who was “good” or “bad” in the past, but the future – especially for pitchers – is hard to predict. Consequently, it is hard for the richest teams to simply spend money and win." He doesn't give any more details, like what years he looked at, if he combined many years together in a regression analysis, etc.